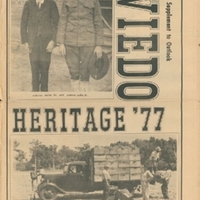 The Oviedo Heritage, a supplement for The Oviedo Outlook, published on June 30, 1977. The Oviedo Outlook was published every Thursday at 173 West Broadway Street in Oviedo, Florida. The newspaper was operated by the NPN Corporation, president and general manager Lawrence E. Neely, vice president and managing editor James "Randy" R. Noles, and secretary-treasurer and business manager Marilyn Neely. Topics discussed in various articles in this issue include the history of Oviedo, Andrew Duda and his family, the history of the Citizens Bank of Oviedo, and the life of Dr. Theodore Luqueer Mead (1852-1936). Original 8-page newspaper supplement: The Oviedo Heritage, June 30, 1977: Oviedo Historical Society, Oviedo, Florida. Digital reproduction of original 8-page newspaper supplement: The Oviedo Heritage, June 30, 1977. Originally published by The Oviedo Outlook. Copyright to this resource is held by The Oviedo Outlook and is provided here by RICHES of Central Florida for educational purposes only. “The Oviedo Heritage '77, June 30, 1977.” RICHES of Central Florida accessed April 24, 2019, https://richesmi.cah.ucf.edu/omeka/items/show/5702.